"Steve has always been very conscientious, detail-oriented and thorough. His promptness is what I appreciate most. When he says the dates he's available, he sticks to them. Steve is a terrific painter, who is very reasonably priced for such a professional and excellent job. I have used Steve repeatedly for both my home and my business needs. He is awesome and is the only painter that I use. I recommend him as often as I can!" "NDB originally painted my entire interior, with the exception of two rooms as requested. I had them back the following spring to paint the exterior. Steve completed the job on time as promised and the job was completed to my satisfaction. I have already recommended NDB to friends because of the professional service they deliver." "We had our home's exterior painted and it turned out beautiful! NDB's prices are reasonable and the workmanship was superb!" "Steve did a great job. He completed the job quickly and cleaned up well at the end. We will definitely be calling to have him do some more painting for us." 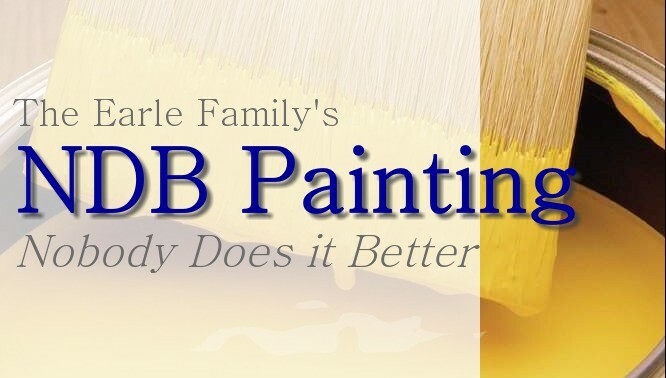 "My experience working with NDB Painting was exceptionally fine! I most appreciated Steve's timely arrival each day and his neatness." "I would recommend NDB Painting because I am completely satisfied with the work. I am a picky person and do not recommend anyone I am not happy with." "I enjoyed meeting Steve. He is very conscientious about his work and I could always depend on him to be on the job when he said he would be. I recommend NDB because his workmanship is second to none!" "Our experience working with NDB was nothing but positive. We most appreciated that the final result met our expectations. We recommend NDB because of Steve's thorough, clean, professional work, reasonable rates, reaction to our immediate need to complete the job quickly, and his willingness to work with us on other projects." "I most appreciated how patient and accommodating Steve was when I decided to change colors after he had already started the job! I recommend NDB because they are professional and fairly priced." We would love to add your name to our ever growing list of satisfied customers. Contact Us with questions, to schedule your free estimate, or to submit your own testimonial. When submitting a testimonial, please specify how you would like for your name to be displayed. In the interest of protecting your privacy, we suggest using your first name, last initial, city & state. We appreciate your business & your comments! Our small, successful family business has been built upon hard work, excellent customer service and referrals from our happy customers. Because our primary source of advertisement is word of mouth, in 2010, we decided to show our appreciation for our customers with an on-going Referral Program. Click for details.